We have another author in the house. 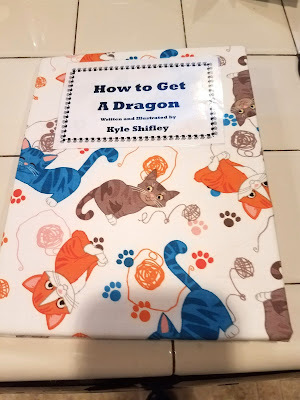 Kyle wrote and published a book for a 2nd-grade project. I guess the apple doesn't fall too far away from the tree. I love that he named the boy "Bob" because Bob has to be one of my favorite names of all time. And I also love that dragons speak "dragonese." Not too shabby if you ask me. I finally saw "Manchester By The Sea." I can’t undo that. Boy oh boy, was that ever uplifting. Since I still don’t have a sarcasm key then I will put it in italics. I was a little disappointed because I don't get that much time to watch movies these days and I wished I would have picked something that didn't leave me "Crestfallen By The Boise." I tried to be funny and parody the Manchester movie title. Didn’t quite nail the landing on that one. Anyone have something better. 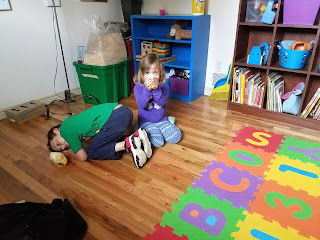 We adopted two baby chickens – Cuppy and Leafy – and as you can see the kids are pretty happy about it. I have no idea about the names. Kyle told me why but he might as well have been trying to explain Quantitative Methods in Economics in dragonese to me. Here's a GIF of person dressed up as a dinosaur riding a motorcylce for no reason at all. Recommendation of the week: If you are trying to claim you have no ties to Russia by sending out a certified letter then make sure the law firm you hired wasn't named the Russia Law Firm of the Year in 2016. Coincidence? Joke of the week: What does the sign on an out-of-business brothel say? Beat it. We’re closed. Happy Mother's Day to all you amazing ladies out there. Thank you for your love, guidance, and support. Enjoy your special day. 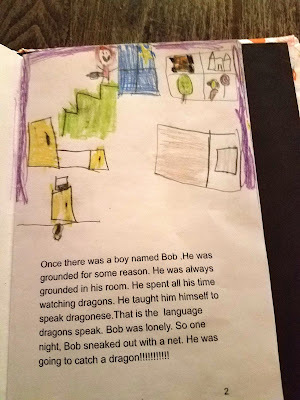 Poor Bob, grounded for 'some reason', unbeknownst to all. Sounds like a cute book. I hope Ms. Frizzle isn't a bird dog! First of all, congratulations on officially having the longest comment ever on my blog. Second, don't feel bad about the weather comments. My wife keeps telling me that she doesn't even look at the weather online; she just waits for me to tell her. I like Kyle's story. Those types of assignments are my favorite things that come home from school. Are your chicks being raised for eggs or for fun? Like kden said, let's hope Ms Frizzle isn't interested! Never heard of brothal jokes, but why not. Like father, like son. Two authors in the family - how great is that? And chicks to play with, it must seem like heaven in your house. Enjoy the weekend. is hayden going to be the mother of dragons?